Are you seeking UNCOMMON COACHING to propel you forward on the web to impact the world for Jesus? My assignment is to be a catalyst to reclaim the web for Jesus Christ. As Ted Baehr, founder of Movie Guide, says “He who controls the media controls the culture.” And the Internet is the most powerful type of media, bar none. It’s time to take back control of our culture through the web. I’ve been saying over and over, “When the Holy Spirit authors a message, the Internet becomes God’s SUPERNATURAL highway of communication!” In war, the enemy almost always attacks communication lines first. That’s why so many of God’s people, churches, and ministries are blind to this revelation. It’s time for God’s children to have their eyes opened. On Wed March 19 at Noon EDT, I am hosting a free online “UNCOMMON Internet Marketing Seminar.” Michael Stay, one of the best strategic planners in the world, recently told me my main business is Internet marketing education. In this webinar, I will pull together the wealth of knowledge and experiences I have accumulated over the past several years. I encourage you to invite your friends and networks to participate. People from around the world can join in. To learn more and to register, CLICK HERE. Who do you know who might benefit from this webinar? Heavenly Father, I’ve done my part. Now I ask You to do Your part. 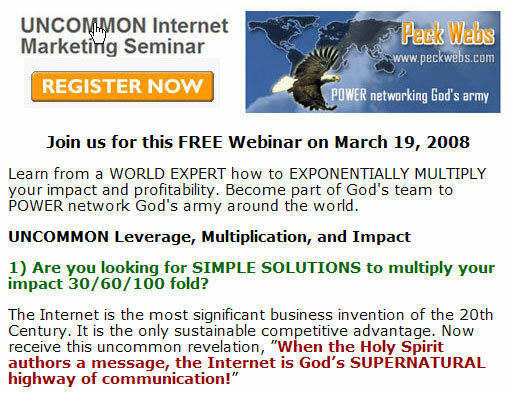 Invite people from all over the United States and world to participate in this UNCOMMON Internet Marketing Seminar on March 19. Prepare the hearts of Your children to receive and act on this direct download from Your Holy Spirit. To You be all glory, honor, and praise. In Jesus name, I pray. Amen and hallelujah! 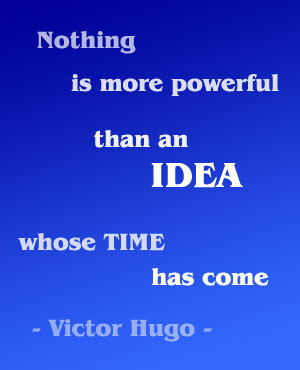 Blessings to make the choice to seize this UNCOMMON opportunity for explosive impact!